Kavi: Can I learn to make something today? Me: How about I teach you how to make a white sauce? We have some leftover pasta and tandoori chicken to use up. Me: You know, this is going to make your college roommates very happy with you. Kavi, barely restraining her pre-teen eye-roll: I’m sure everyone in college talks like that all the time. Basic béchamel recipes are all over the internet, but essentially, warm milk in pan or in microwave. Then in separate pan, melt butter on medium heat, stirring (careful not to brown). Next, make the roux — add an equal amount of flour (about 6 T butter to 3.5 T flour is standard, with 2 c. milk, though I admit, I mostly eyeball it), stir until it’s a bit clumpy. Whisk in a little of the warm milk to smooth it out, then add the rest of the milk and whisk whisk whisk, stirring, until it thickens. Stir in your cooked pasta, shredded leftover chicken, maybe some frozen peas, and you’re good to go. 10-minute easy delicious & nutritious meal to feed a hungry college student and her roommates. Experimenting with tofu shirataki noodles (shirataki is made of yam, and is extremely low-carb, low-calorie, and gluten-free); here I added them to a simple Thai yellow curry. Take one can Maesri yellow curry paste, add one can Chaokoh coconut milk, heat in a large saucepan on medium high heat. Stir in a t. of brown sugar and a T of fish sauce. 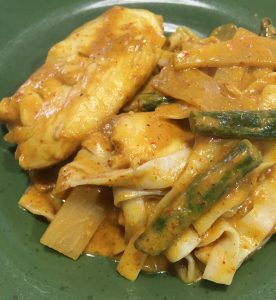 Add two frozen tilapia filets (no need to thaw), one can drained bamboo shoots, and half a pound of trimmed green beans, simmer until fish is cooked through, 10-15 minutes. 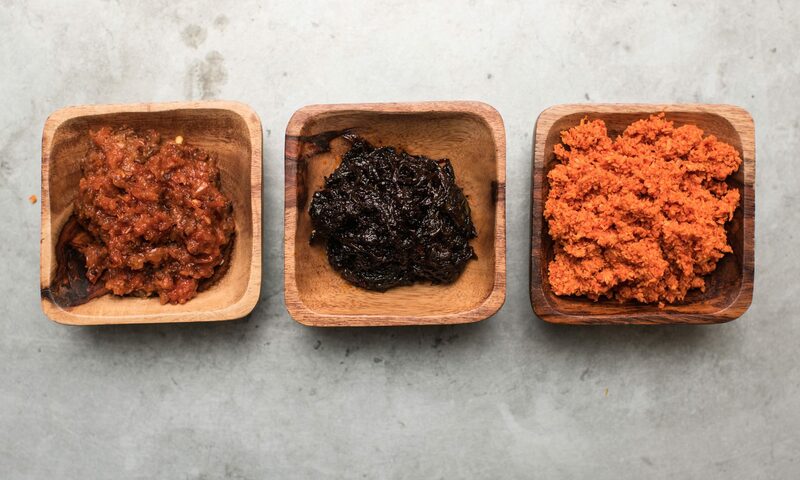 That’s your basic curry; use the protein and veggies of your choice. Usually I’d serve this with white rice, but I’m trying to eat a little less white rice these days (sob! ), so experimented with shirataki noodles. Follow the instructions on the package — rinse noodles well and drain, toss in boiling water for 3 minutes, drain again. Then stir the noodles into the curry and serve hot. I’d call this a qualified success. 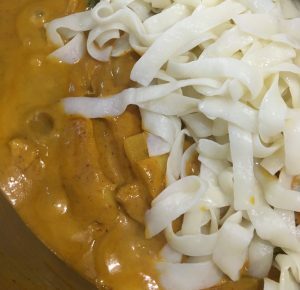 It doesn’t taste as good as eating the curry with rice or the kind of noodles you’d use for pad thai; the shirataki noodles retain more bounce / tooth to them, so just don’t blend into the dish as well. But that said, they’re very neutral; I ate a big plate of this and was reasonably happy with it, and will be happy to eat more tomorrow as leftovers. At something like 20 calories for the entire package of noodles (of which I ate perhaps a third), it’s at the very least a good option to know about if you’re being careful about calories or carbs, or need to eat gluten-free. New year, new eating plan. 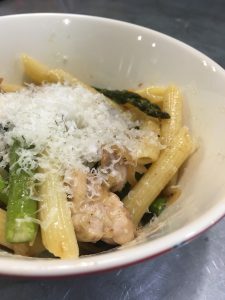 Our kids are eight and ten, and we’re trying to eat a little healthier all around, and hopefully get them to eat more of the same foods we do; we’ve spent too long making separate meals. All of us could stand to rely a little less on packaged meals and easy carbs. So we’re trying to do some joint family meal planning, which is challenging because I have to give up a little control. I love control. But that said, it’s also a good way to get me out of my default curry-all-the-time rut. I used to cook lots of other things. 🙂 Tonight, we went Italian, with plenty of protein and vegetable, a little pasta to fill things out, and not stinting on the butter and Parmesan, salt and pepper. I was aiming for an easy weeknight meal, taking no more than thirty minutes to cook. The trickiest part about this, I think, is sequencing it so that you’re never really pausing, but you’re also not hurrying, and it’s all done at about the same time. If you’re more of a new cook, this will probably take a little longer, until you get the hang of moving smoothly from task to task. 2. Set a pot of water boiling for pasta. 3. 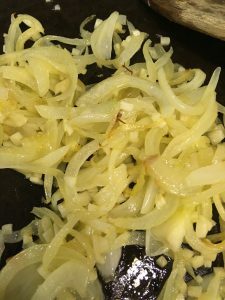 Slice onion thinly, start sautéing in a large frying pan with 1-2 T olive oil. Turn heat down to medium, so you don’t need to watch it like a hawk. Chop three cloves garlic, stir them in. 4. Cut chicken into bite-size pieces, stir them in. Season with salt (about 1/2 t.) and pepper (ditto). Turn heat up to high for a bit, so the chicken will sear; cook, stirring. Then you can turn it back to medium or even low if you like, and let it keep cooking, stirring occasionally. If it seems a little dry, add a T of butter at this point. 5. By now, your water should be boiling. Add penne, stir, and set timer for 10 minutes. Check on the asparagus; it should have a few more minutes to go. Stir the chicken. Pour yourself a glass of white wine, if you’d like. Pour a little into the pan, if you like. 6. 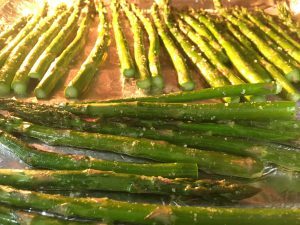 When the asparagus timer goes off, remove it from the oven. Eat a few spears right then, because they are at their most delicious like this. Try to save most of them for the children. Transfer to a cutting board, and cut into bite-size pieces. 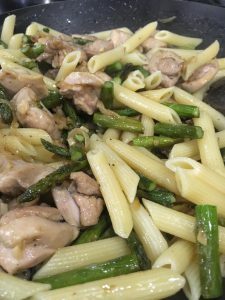 Add asparagus to the chicken in the pan, stirring to combine. Serve hot, with fresh Parmesan to grate over. Yum. NOTE: If you have picky eater suspicious of bits of onion / garlic, you can just toss the chicken in 1 t. each of onion and garlic powders before sautéing. 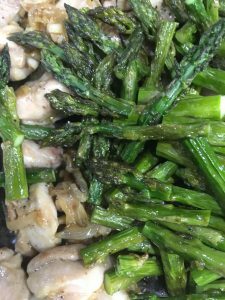 You can also serve the asparagus on the side, instead of cutting it up and mixing it in. And finally, if you happen to have cherry tomatoes on hand, cutting them in half and stirring them in at the very end would not be a terrible idea. I was sadly out of them, or I would have!